Today is Friday, in case you didn’t get my singing memo. 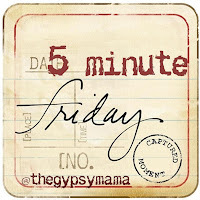 And Friday in this gal’s blogging world specifically means it’s FIVE MINUTE FRIDAY. For those of you newcomers, on Fridays I link up with The Gypsy Mama… she gives us a prompt and we write for five minutes flat. No more, no less. Just letting the words flow. No editing, no over-thinking. Challenging, fun and theraputic. My kind of Friday fun. Ok, enough yammering on my part. Let’s get this Friday party started. Todays prompt is GIFT. His comings and goings make my heart pound. “When will he return?” As an army wife, specifically the spouse of an infantry drill sergeant, this question is often in my mind. God has called me to this role and while it is a challenge… it is also a gift. Now that is true love’s gift. My husband and I have been apart during our relationship more than we have been together in the same zip code. Just this morning, I kissed him goodbye as he prepares to pick up another basic training cycle. He will be home off and on for the next several weeks, but our “quality time” will be rare. It’s getting up early on a Friday to cook breakfast for him before cycle picks up. It’s helping him bottle his home-brew. It’s the front porch conversations. It’s the sideways hugs before we drift off to sleep. It’s the words of comfort as he holds me when I cry. It’s sharing a moment of prayer together. It’s loving each other unconditionally, no matter what challenges are in our midst. Being married to a soldier is a challenge… but such an incredible gift. Very similar to True Love’s Gift on the Cross. Blessing. Sacrifice. Hope. Trust. That is True Love’s Gift. I love frozen yogurt. And I love Jesus. So what happens when you put the two together? A dang good, heart-healing, God glorifying experience. Last night my husband, my cousin Hailey from Oklahoma and I had the chance to do our 2nd official monthly “Factor of 7.” (For more information on this movement, click here.) 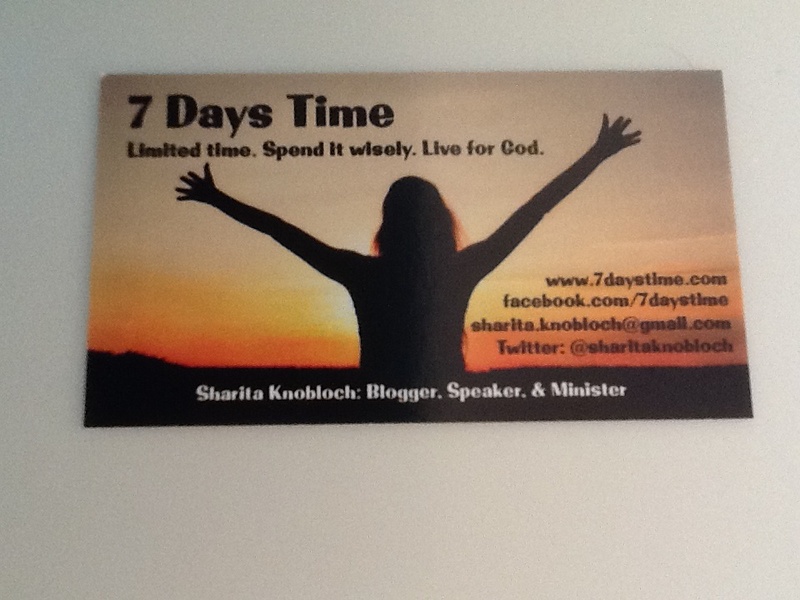 In addition to blogging daily for this ministry, God has laid on my heart to DO something at least once a month. So this time, we took $107, my nifty new info cards and a notebook, and we camped out near the register of one of my favorite treat spots: Chill Frozen Yogurt in Columbus, GA. The principle was quite simple. We paid for the next $107 worth of yogurt that came through the line, then asked people how we could pray for them . It was probably the coolest 30 minutes… EVER. As folks came through the line and the sweet cashier Whitley told them to put their wallets away, their reactions were priceless. Some were suspicious. Some thought they were being punked we were bringing back ol’ school candid camera. But as they approached our table and I said, “First name and how can we pray for you…” Their was nothing in their hearts but gratitude. Many of them were shocked… I mean shoot, I would be pretty stoked about free yogurt on a random Tuesday! But shock aside, every single one of the 35 people that came through the line were receptive to our request of letting us pray for them. Talk about knocking our Jesus socks off! As we were nearing the end of our $107 amount, one couple came back in the store after they left and handed us a $20 bill… They wanted to make a donation. (Side note: My heart almost exploded with joy!) I told them to add that to our “total” at the register. So overall, we were able to share a spoonful of faith with 35 people and provide $127 worth of fro-yo on a random Tuesday. I could write about 12 blog posts from the reactions, answers and great little Jesus moments that grew out of this small 30 minute event. But instead, I pose a question to you: How will you give someone a spoonful of Jesus lovin’ today? Sharing His love doesn’t have to be an all day event. Pay for someone else’s lunch today. Mow your neighbor’s yard without being ask. Buy the person in line behind you their Starbucks for the day. Give someone a hug and ask how you can pray for them. The possibilities are endless, folks. Be a Factor of 7… It can be simple as finding somewhere (or someone) to “Chill” with Jesus. Pretty romantic huh? Probably sounds like every chick flick ever produced. But I am not talking about anyone tall, dark and handsome (or blonde with blue eyes in my case.) I am talking about God. Our Father. Our One. Perhaps I should back up a little bit. God (obviously) loves us and woos us. Last week, I had a dream where God told me to fall back in love with Him. A few days later, I awoke in a panic, realizing that I hadn’t had my official CRAVE time (quiet meditation) with Him at church in over a month (maybe even two!) 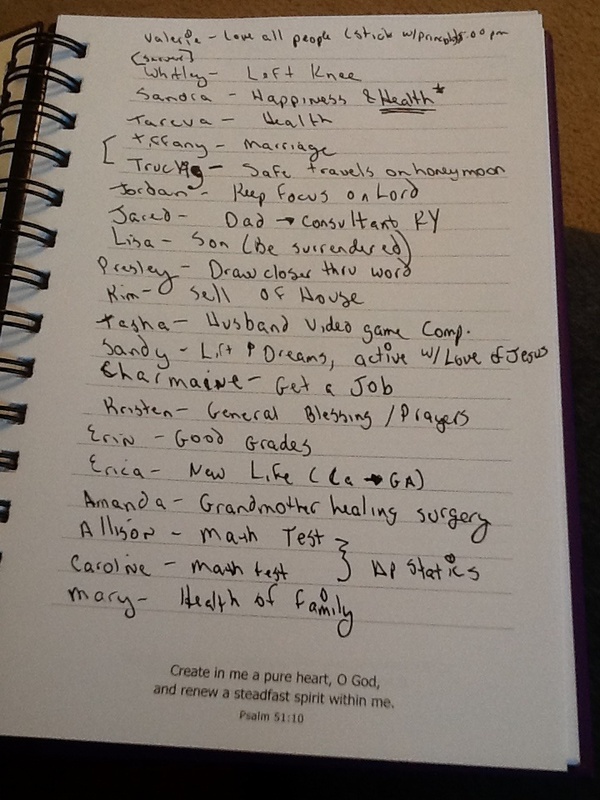 I had been doing my daily Bible study during our leave vacation, but my heart wasn’t really focused. My mind was all over the place, and I bet if you pick a page on my journal from the last two weeks, it will be pointless gibberish. I arrived at CCC and was blown away. The worship song line up was incredible. (Good thing they didn’t play Amazing Grace, or I would have been sobbing face down in the aisle.) I felt myself falling… back in love with God. Then the message sealed the deal. Why? Because for the first time in my experience at Christ Community, we actually had a mini CRAVE time. But God is our father. And He adores our acts of love, as small as they might seem in our eyes. We are like the child, coming home from school and giving Dad a picture with dried out noodles on it. Our small actions are simply love in the form of macaroni art. He doesn’t throw it out. He appreciates it and puts it on the fridge. The stores are already putting out Valentine’s candy, so for the next month and a half the world will pushing THAT holiday (didn’t we just finish UP a holiday season?) But the cards, flowers and candy don’t mean as much as the macaroni art that we can give to God. It’s a new year. How are you going to fall deeper in love with God? What kind of macaroni art are you going to make for Him in 2012? And last but certainly not least… This is our Christmas letter to my dear sister Kathleen and her husband Chris. Merry Christmas! 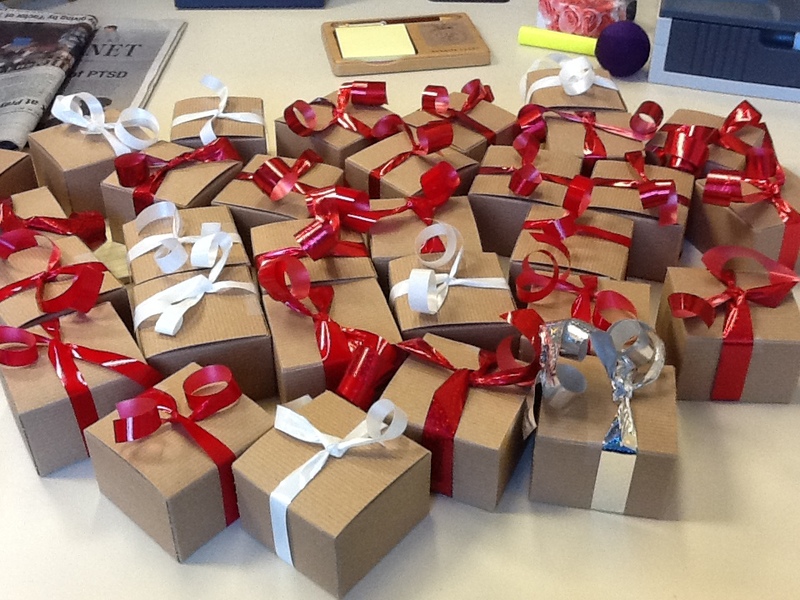 This year’s gift to you is a little different than normal. We wanted to go a different direction since God has really been doing a work on our hearts over the last several months. I know we all enjoy getting “stuff,” but we have chosen to give something that won’t collect dust or break. Your gift for Christmas 2011 is a donation in your name to PAWS Humane Society. Why did we choose this for you? Because you both have such loving, giving and adopting hearts… from kittens, dogs, ducks, calves and even people. It is an inspiration to us in OUR marriage to love on others like you do, giving, especially in the name of Jesus. Thank you for being such a loving, caring and strong couple. Each time we hear about a new “adoptive” adventure from you, we can’t help but think of Jesus’ loving and adoptive heart. He invited us to be a part of His family when we least deserved it. We pray that this gift will go on and continue to bless others that are contemplating adopting a pet, farm animal or even person. As a result, we hope that God will continue to be glorified. So Merry Christmas, Kathleen and Chris. We love you with all we have and pray that someday as we all grow in our marriages, that we can bring our adopted pets, families, brothers and sisters together in Christ to celebrate God’s eternal gift. Your gift for Christmas 2011 is a donation in your name of 2 Chickens to a family through World Vision. Why did we choose this for you? Because you have such a passion for agriculture and your successful endeavor with the chickens doesn’t have to be limited to just your backyard. This donation will give a starving family a new protein source and help them to be nourished in a way they have never experienced. Thank you for being such a wonderful little brother. We are excited to watch you grow and pray that you will walk in the footsteps of Jesus. Each time we eat an egg for breakfast, we will think of the hope that we have for you in our hearts as you continue to get to know the Lord and Savior of the world. We pray that this gift will go on and continue to bless others that are also contemplating the salvation promise of Jesus. This gift does not only represent nourishment of the body, but it shows the spiritual nourishment that Jesus can provide once you invite Him into your heart. So Merry Christmas, Brother Dal. We love you with all we have and pray that someday we can celebrate alongside of you when Christ becomes the center of your world. We long to celebrate God’s eternal gift with you! 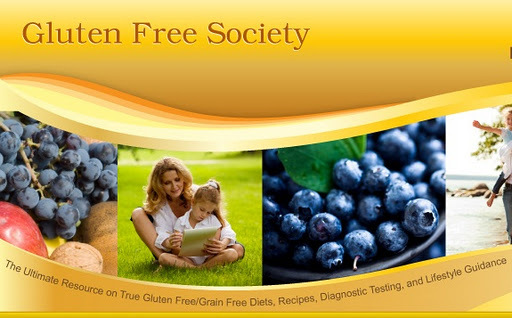 Your gift for Christmas 2011 is a donation in your name to the Gluten-Free Society. Why did we choose this for you? Because you have raised a daughter who has followed in Christ’s footsteps alongside a Godly husband. When you both gave your lives to Christ, you gave up your own control, but allowed him to direct your path and heal you in ways unimaginable. Thank you for being such loving, encouraging and dedicated parents. Whenever we recall your amazing testimony, whether together or separated by duty, we will not only think of God’s grace, but also the wonderful gift you give us year round… Love and support. We pray that this gift will go on and continue to bless others around the world that are struggling with the same physical issues. As a result, we hope that God will continue to be glorified. So Merry Christmas, Mom and Dad. We love you with all we have and pray that someday, we might raise our children with love, respect and submission to Christ, just as you have done with both of us. The first up in our line-up for gift sharing of this season are my parents-in-love (yes, not parents-in-law, but parents-in-love) Mama Lex and Daddy D. Below you will find the gift that Brandon and I gave them… To not only live Christ-mas one day a year, but to have Christ-more everyday! Your gift for Christmas 2011 is a donation in your name to our local Christian Radio Station 88.5 The Truth. Why did we choose this for you? Because you raised a son to live his life on the solid rock, living in the Truth every single day of his existence. And due to that upbringing, he has led his wife to the cross, and we are now walking in the footsteps of Jesus… Together. Because of both of YOU. Thank you for being such loving, encouraging and prayerful parents. Whenever we listen to The Truth on our radio driving in our car, whether together or separate, we often think of you and the wonderful gift you give us year round… Love and support. We pray that this gift will go on and continue to bless others around the world that has an opportunity to listen in. As a result, we hope that God will continue to be glorified. So Merry Christmas, Mom and Dad. We love you with all we have and pray that someday, we might raise our children to live the Truth, just as you have done with your beloved sons.